Today Google CEO Sundar Pichai announced Google’s new cloud-based gaming service, created to provide gamers with high quality gaming from a variety of different devices and smartphones to desktop PCs. 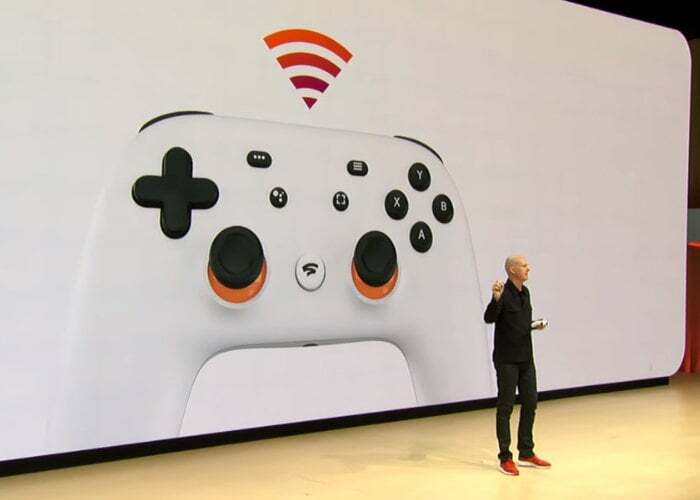 During Google’s Stadia presentation at this year’s Game Developers Conference 2019, the search giant explained it wanted to build a gaming platform for everyone, and break down barriers to access for high-end games. “Stadia, a new gaming platform from Google for playing AAA video games across all kinds of screens.” Watch the videos below to see the official unveiling of the new cloud gaming platform by Google. Assassin’s Creed Odyssey and DOOM Eternal are currently the only confirmed games that will be available on the platform but you can expect more titles to be added to the launch lineup. There are already 100+ studios with Stadia development kits in-house And Google has created its own Stadia Games and Entertainment first-party publisher, so expect plenty more games to be added to the cloud gaming service. Whichever device you choose to choose to play on, the device will only act as a display, while the actual processing and graphics will be handled by Google’s data centres via a connection through the cloud. Stadia promises to deliver 4K 60fps streaming in HDR along with surround sound, but obviously you will need decent stable high-speed Internet connection to be able to benefit from this cloud based service. – Play across multiple devices, including laptops, desktops, and selected phones and tablets. – Go from watching a video to playing a game in seconds, with even more innovative experiences to come. – Up to 4K HDR at 60 FPS. Enjoy gaming the way you like it, with beautiful HDR graphics and smooth frame rates. – Play instantly. No updates, no downloads. Dive right into the game. – Stadia’s cloud-based infrastructure evolves to meet the demands of players, developers and YouTube creators. As soon as more details are announced regards the games you will be able to access through the Google Stadia cloud gaming service will keep you up to speed as always. In the meantime jump over to the official Google Stadia website to register your details and be informed when the service will be rolling out in your area.